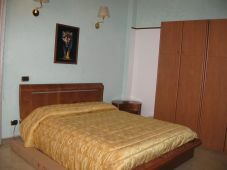 The B & B is located in a building of 5 floors in a very quiet and green. Is a short distance from EUR enticing offices and major hospitals such as St. Eugene, San Rffaele, the Campus Bio Medico and Hospital Isrelitico. It is located close to major shopping centers such as barns, EUROMA2, Castel Romano Outlet. Convenient for those who want to attend concerts and events that are held at Palalottomatica. It is easily accessible by subway and by bus from the bus 768 or 763 from the bus Laurentina Eur Fermi. It ’has just been renovated and offers 4 rooms where guests can be arranged from 1 to 4 guests, each room with a bath for exclusive use. It offers guests a kitchen and a dining room where breakfast or prepare a hot meal without going to spend money out. If you want, however, there are many nearby local where to eat lunch or dinner and within walking distance. The price includes breakfast and cleaning except Sundays and other holidays.